Goiás and Vila Nova fans clashed in the stands after the final whistle of their Serie B match at the Estádio Serra Dourada in Goiânia, Brazil on Saturday. 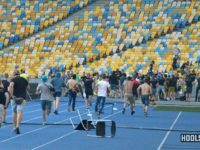 An Ukrainian Amateur League final between Metalist 1925 Kharkiv and Ahrobiznes Volochysk was abandoned on Monday due to a pitch invasion and fighting in the stands. Ruch Chorzów hooligans briefly blocked a major highway in Katowice on Friday evening to burn a giant GKS Katowice flag.